With 8 minutes, 12 seconds remaining in the third quarter of USD’s 2015 football season opener against San Diego State, Toreros quarterback Anthony Lawrence jogged onto the Qualcomm Stadium field for the first play of his college career. against Western New Mexico. Head coach Dale Lindsey gave the ball to Lawrence, who proceeded to throw for 254 yards and four touchdowns in a 45-21 victory. Lawrence would be the starter for the rest of the season. 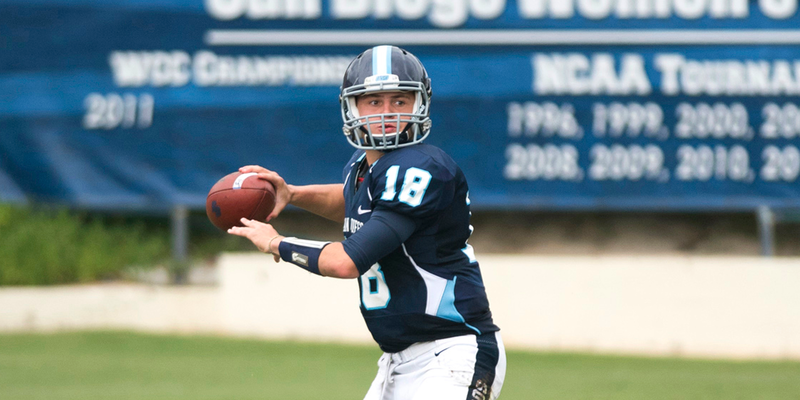 He guided the Toreros to a 9-2 record and a share of the Pioneer Football League title, completing 64 percent of his passes for 2,392 yards and 23 touchdowns. He suffered only six interceptions. By a vote of his teammates, the young man who began the season on the bench was selected USD’s most valuable player. When Lawrence reported to USD in August 2014 he was one of four new quarterbacks. At a fraction over 6 feet tall and weighing 190 pounds, he was the smallest of the new QBs. He did not possess the strongest arm. Lawrence is football’s equivalent of a basketball gym rat. He began playing Pop Warner at the age of 9 and was a three-year starter at Grossmont High, throwing for a San Diego Section-record 9,079 yards. As for dedication, he was strong enough in high school to lift weights with the offensive linemen, and in an effort to grow as tall as possible, he would hang upside down in gravity boots. He’s liked by his USD teammates for multiple reasons. He can be playful, jawing with defensive backs, telling them he could turn them in circles if he played wide receiver. He’s independent, rocking about campus in turtlenecks and shorts that stretch far above the knees. “He’s a fashion statement,” jokes Priest. But mostly he’s respected for the way he plays the game. Lawrence’s memorable redshirt first-year season ended in frustration when he broke his right leg in a season-ending home victory against Butler. Despite a second surgery necessitated by infection, he recovered and is expected to be behind center at the start of the season. With three years of eligibility remaining, Lawrence might one day threaten Mason Mills’ school record of 11,099 yards passing. He’s not thinking that far ahead, though.